Know About Healing Their Pets"
...your dog or cat could be seriously ill and live a "shortened" life! 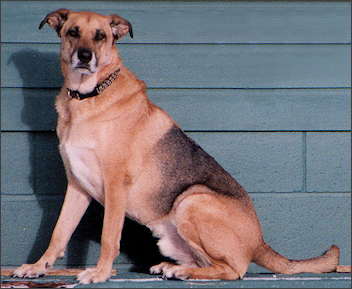 Hoochie passed away in my arms from a massive tumor bleed at 12:02pm on April 12, 2003 - the saddest day of my life. I thought that he was incredibly healthy. But I later discovered I may have contributed to his death, because I believed ONLY in conventional veterinary medicine. You see, I am a Veterinarian. 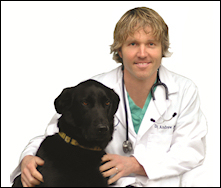 I'm Dr. Andrew Jones, and I have practiced Veterinary Medicine for 20 years. Over the past 2 decades I have treated thousands of pets for a variety of problems, and until recently I owned the Nelson Animal Hospital in Nelson BC, Canada. But, my beloved dog Hoochie is gone. You are fortunate... it is not too late for you and your pet, if you read on and find out exactly what you must do now. Today, I'm going to show you why conventional medicine may be harming your pet, and step-by-step what you must do to protect your dog or cat. Most likely you've heard about or your pet has experienced negative side effects that some Conventional Medication can cause. But fortunately, conventional medicine isn't the only solution. And although Alternative Pet Health Care has grown over the past few years, the simple truth is that very few pet owners know anything about it or believe that they can do anything at home to help their pet. Lock the door, Unplug the phone, and do whatever you can to have 10 undivided minutes... Get ready to read about how you could be saving the life of your pet starting now! "I began to notice something unusual..."
Slowly, I began to notice something unusual about Hoochie. He just wasn't the same. He was reluctant to go for his morning dog walk, which was always the highlight of his day. I dismissed it as him feeling a bit off or maybe a touch of arthritis... but it didn't pass. In fact, it got worse. I eventually did a blood test on Hoochie, thinking that he had a tooth infection. However, much to my horror, I quickly found out that he had a spleen tumor. I performed surgery on Hoochie right away, and removed the spleen tumor. But it was too late - the cancer had already spread to his liver, and I knew that very soon, he would die. How did an apparently healthy mixed breed dog die so young? I did all the "right" things - or so I thought. After grieving, I came to realize that I had played a role in him dying at too young of an age. I came to question exactly what I did to my own pet - and what was I doing to other people's pets. Eventually, I realized the obvious - that most Veterinarians (including me as well, at the time) are just not "getting it" - that in the process of trying to heal pets through technological advances, we are actually making them sicker. ...are you making these same mistakes with your own dog or cat? I gave Hoochie his combination of vaccines every year until he died. I advised pet owners to vaccinate their pets yearly, so I gave my own dog the same vaccines. The vaccines likely contributed to him developing spleen cancer. "Recent vaccinations with single or combination modified live virus (MLV) vaccines are increasingly recognized contributors to immune-mediated blood diseases, bone marrow failure, organ dysfunction and cancer." Dr. Jean Dodds, one of the world's foremost experts in canine vaccine reactions. Hoochie was fed a Veterinary approved food exclusively, yet he developed Spleen cancer at the age of 8, and died shortly after. The "Bright Minds" in the pet food industry have created unwell pets, producing increasing incidences of diabetes, cancer and allergies. Remember the Pet Food Recall of 2007? This is the trust that we place in pet food companies... we assume that our pets' food is safe, that the 'powers that be' have our pets' best interest at heart. In the case of those companies, that is definitely not the case. The food that Hoochie ate was filled with chemical preservatives. The unnatural preservatives played a role in the cancer. "BHA and BHT are known to cause liver and kidney dysfunction and are banned in some European countries. Ethoxyquin is suspected of causing cancer, and that propylene glycol, another common pet food ingredient, causes the destruction of red blood cells." Dr. Wendell O. Belfield, author of 'How to Have a Healthier Dog'. Hoochie was showing signs of arthritis, so I had been giving him a conventional veterinary medication. He responded to the medication, but it likely played a role in damaging his organs, making him susceptible to cancer. NSAIDs carry a risk of side effects, or adverse reactions. Most adverse reactions are mild, but some may be serious, especially if the drugs are not used according to labeled directions. Some reactions result in permanent damage or even death. "It's important for pet owners to be aware of the risks and benefits of all drugs, including NSAIDs, so that they can make informed decisions about their pets' health care," says Sundlof. "Owners who give their dog NSAIDs need to know the side effects to watch for that indicate their pet needs medical attention." Stephen F. Sundlof, D.V.M., Ph.D., Director of the Food and Drug Administration's Center for Veterinary Medicine (CVM). A very popular NSAID is Rimadyl. It has resulted in all the above reported side-effects. In fact it was first created as a human anti-inflammatory product, but due to the incidence of serious liver side effects in clinical trials, it was pulled from the human market. The drug company, Pfizer, then brought it back to life in the pet industry. I, a knowledgeable veterinarian with over 15 years of experience, contributed to my pet's death. I came to question exactly why I believed in utilizing only "conventional" veterinary medicine to heal pets. I questioned all the "scholarly information" that I had been taught in veterinary school. It happened because I didn't question modern veterinary medicine, and I gave Hoochie harmful medication, I fed him "Veterinary approved" food, and I injected his body yearly with cancer inducing Vaccines. I gave him the medication, the vaccines and the carcinogenic food. Yes, my profession, the large drug companies and the food companies played a role. But, I should have known better. HOW can I prevent this from happening again to another pet? From the anger, the pain and the despair, a switch happened. I began to read, to research, to discuss with other colleagues the pitfalls of the current state of modern veterinary practice, and I began to write a book. I spent thousands of hours exploring ways for pet owners to administer first aid, improve behavior problems, and even treat illnesses using readily available household products. I began using my "newer" style of medicine in my practice, and my patients benefited tremendously from this research. My book was first published on-line, in digital (e-book) format, in May of 2004 - about one year after Hoochie died. The book is called "Veterinary Secrets Revealed." 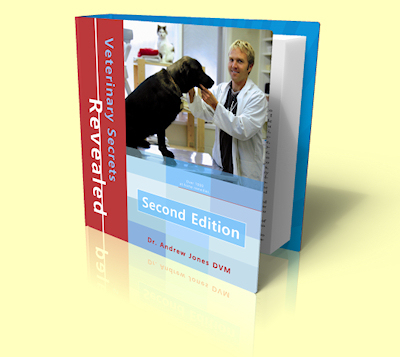 And now the Second Edition of Veterinary Secrets Revealed is available - and it's been updated for 2012! My second edition has built upon the foundation of the first one - and it's now a HUGE Manual, at 500 pages long. ...And Save Thousands Of Dollars In Vet Bills! To read more of what other people have to say about Veterinary Secrets Revealed, click here. What do you do if your Pet has Itchy, red and irritated Skin. Use a common over the counter medication (page 129). Heal your pet's itchy skin today. Table of Contents of Veterinary Secrets Revealed, Second Edition. The feedback on Veterinary Secrets Revealed has been wonderful, and I am very grateful to hear how much of an impact Veterinary Secrets Revealed has made. My email has been literally flooding over with questions and great comments from fellow pet lovers. My colleagues, on the other hand, have not responded so well. I'm not going to 'get into it' in this letter, but I went through a legal battle with my local Veterinary Association about my book, websites and daily newsletter. In 2010, I resigned from my Veterinary College (in British Columbia, Canada), because I refused to stop publishing my newsletter and book - I felt very strongly that they were impeding my freedom of speech. You can watch the Global News story on why I resigned here: Dr. Jones Resigns. It's simple. I've seen too many pets and their owner's suffer because they relied exclusively on their Vets to receive medical care. Delay bringing their pet in for treatment because the pet becomes ill after hours. Rely exclusively on harsh drug treatments because they (and their vets) are unaware of effective, gentle, natural ways to treat their pet. Discontinue treatment for chronic illnesses because it's complicated or expensive. Aren't able to afford an office visit and or follow up treatment. Another reason is that I absolutely love empowering pet owners like you with my book and with what I teach. It's something that I enjoy doing every day - if you haven't already, sign up for my newsletter (see below) and you'll quickly find out what I stand for (check out my blog as well). Instantly decide on a course of action for your ailing pet - so you can ease pain and start treatment immediately. Easily afford natural and effective remedies regardless of your financial situation - so your pet doesn't have to go without treatment. Quickly diagnose your sick or injured pet - so you can instantly know if you can administer care yourself or if you should seek medical help immediately. 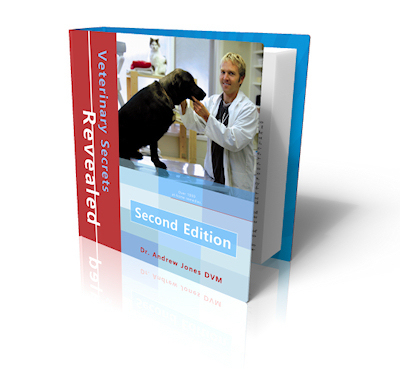 You will be delighted by how much you will learn from Veterinary Secrets Revealed. It may even help you save your pet's life some day! And if your pet is in discomfort right now, you're just two minutes away from being able to offer the relief your pet has been hoping for. In order to reach as many devoted pet lovers as humanly possible, "Veterinary Secrets Revealed" is a digital book (e-Book) that can be delivered to you in a matter of seconds in e-Reader (iBooks for iPhone/iPad, Kindle, Nook, Sony, Kobo and all e-Readers) and in PDF (for use on all computers) format. That's right, as soon as you submit your order on our secure server (your payment details are absolutely safe) you'll have immediate access to the information that can improve the quality of your pet's life, and maybe even prolong it. Topics are listed in the table of contents in alphabetical order so it's easy to find information on your own pet's particular problem. Pictures of each problem are placed immediately above the description of the problem to make it easy to select and follow the right treatment plan. A detailed index at the end of the book (pdf version only) takes you right where you need to go when you're searching for more detail. Indexing is a long and tedious process, and it's often left out of eBooks, but not this one! In an emergency, you need to be able to find what you need instantly. In the mobile version of the e-Book (Kindle, iPad/iPhone, Nook), just enter your search term in the search box to instantly find what you are looking for - even easier than using the index ! So how much is ensuring your pet's well-being worth? You would have to pay hundreds of dollars to assemble enough books to cover all aspects of treatment in this one book. Books focusing on dogs, on cats, on behavior problems, chronic illness, and even trauma. Then, you'd have to find books on herbal remedies - presuming you already know which ones are safe for dogs, which are safe for cats (there are big differences - some that are completely safe for dogs are toxic for cats) and which could cause complications (including death). Add to your cart books on dental health, acupressure, and homeopathy. Why go through all of the time and expense when I've already done it for you? Plus, I've tested the results! For a fraction of the time and money that it would take for you to learn how to care for your pet safely and effectively, I'm offering Veterinary Secrets Revealed, Second Edition for only $47. The current average cost for ONE SINGLE VISIT to the Vet Clinic is $180.00. The average yearly Vet Bill for one dog is $395.00, and $244.00 for one cat (AVMA, 2006). And if you have more than one pet? The average annual bill for multiple pet households is over $1000.00. For every visit to your Vet that Veterinary Secrets Revealed helps you avoid, you'll save over $100. But the BEST thing is, with my book you will save several trips to your vet - Veterinary Secrets Revealed will pay for itself over, and over, and over again. But each time you visit your Vet, you'll pay again... and again... and again. Get Instant Access - Even If It's 3 A.M. When you click the button to download your copy, you get instant access to all of the information. That means you can relieve your pet's discomfort within the next 2 minutes, no matter where in the world you are or what time it is (even if it's 3 a.m. on a Sunday!). As mentioned above, Veterinary Secrets Revealed, Second Edition is available in all e-Reader formats: ePub for iBooks (iPad/iPhone/iPod), Nook, Kobo, Sony, etc, and mobi for Kindle or your Kindle App, as well as PDF for your laptop or desktop computer. With e-Readers, it makes it easy to search and find the information you're looking for. Veterinary Secrets Revealed, Second Edition is a 500 PAGE Manual - it is not simply an 'e-book'. You can read it on your computer or e-book reader, or you can easily print it out and have it ready to refer to on a moment's notice, should your pet suddenly need the information I've provided. Order now to ensure your pet's safety and well-being. You can order on our safe, secure server and receive the book immediately. No pet owner should be without this e-book." I understand that my order will be processed on a totally secure server. 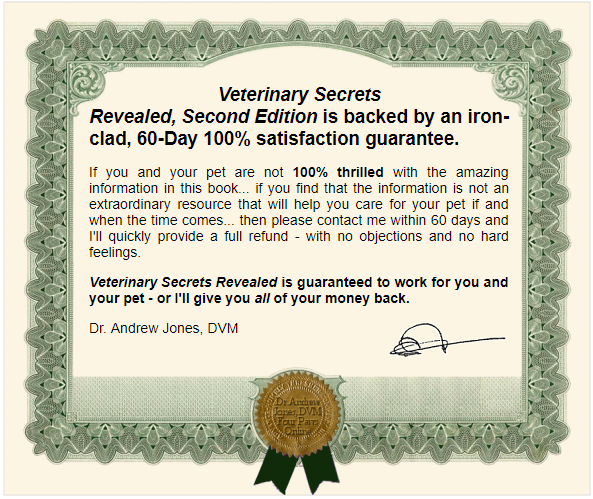 I understand that once my order is processed, I will be able to immediately download Veterinary Secrets Revealed, so I can start healing my pet RIGHT NOW! I understand that I can download Veterinary Secrets Revealed in e-Reader (Kindle, Nook, iPad/iPhone/iPod, Sony, Kobo ~ all e-Reader formats) as well as a PDF format for my computer - I will have access to all versions of the book, and can refer to it whenever and wherever I want. I understand that I have 60 days to test each and every bit of information in your book and if I and my pet are not 100% thrilled with the amazing information, I'll get a full refund. get your download RIGHT NOW! Order now to start examining, diagnosing and treating your pet at home with "Veterinary Secrets Revealed, Second Edition". Looking for the printed/hard copy version? It's available here. You know it's the right thing to do for your pet. And you have 60 Days to see if this information works for you (you can get your money back at any time within that 60 days!). Obviously, there's no risk involved - only security and peace of mind. Please prepare yourself to provide better care for your pet in any situation, for your pet's sake. P.S. - I know you and everyone who truly loves their pets will want to provide for their safety and well-being. So why wait? Order now and you'll be prepared for whatever the future brings to you and your pet. Click here to order now. P.P.S. - Remember that you have a full 60 days to use the information, and if you change your mind, you'll get all of your money back. P.P.P.S. - Compared to just a single visit to your Vet, my book is an absolute bargain. For every trip to the Vet that it helps you avoid, you'll save money. And I KNOW it will help save you many trips to the Vet. Save Money starting today - Order NOW!